Ministry of Women and Child Development celebrating Beti Bachao Beti Padhao week from 9th October to 14th October, 2017. “Beti Bachao Beti Padhao Week- The Daughters of New India” is to be observed as a mark to Celebrate Girl Child and Enable her Education around the week of International Girl Child Day (i.e 11th October). International Girl Child Day is celebrated every year to promote empowerment of girls and reinforce gender equality. i.) 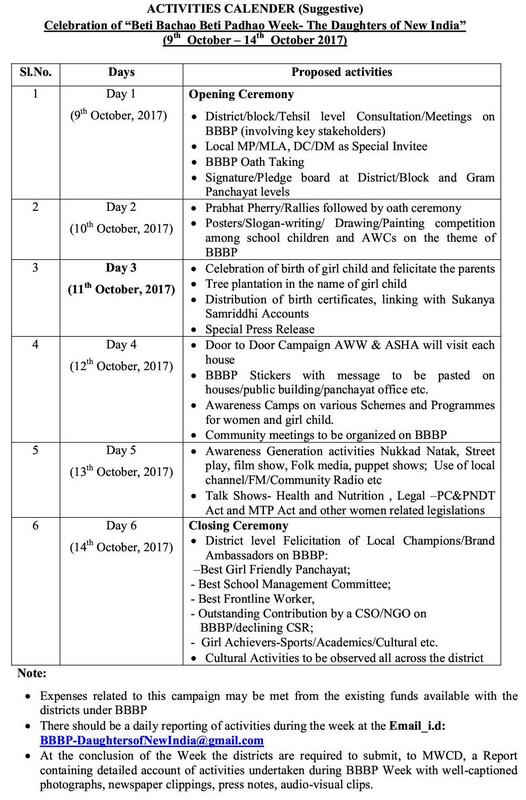 The BBBP Week shall be observed by the selected 161 BBBP districts from 9th October – 14th October 2017 under the leadership of DC/DM. ii.) The districts must plan activities spread over a week which may start with Opening Ceremony on 9th and may culminate into a Closing Ceremony on 14th October, 2017. iii.) 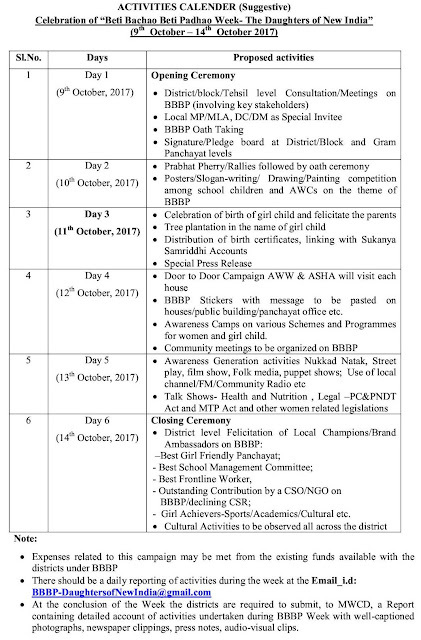 The districts may prepare detailed date wise activities based on the suggestive calendar of activities as provided below. iv.) Dignitaries such as local MLA/MP, Local Women Achievers and District Officials from different Departments, Colleges and School children may be invited. v.) Districts may take steps to undertake innovative initiatives during the campaign so that case studies and stories are generated daily. vi.) Districts should ensure better branding and visibility of BBBP logo during conducting of activities as well as their promotion through electronic and print media platforms at both field, district and state levels. They need to make use of social media such as my Gov, Twitter and Facebook extensively for the purpose. vii.) A pre-press release (curtain raiser) should be issued highlighting activities to be undertaken and another post-press release highlighting major outcomes of BBBP Week. viii.) A press conference may be organized by the concerned district at the culmination ceremony of their Week to highlight the activities and initiatives undertaken. This may be addressed at the level of DC/DM. x.) At the conclusion of the Week the districts are required to submit, to MWCD(Sh. Ashok Kumar Yadav, Deputy Secretary, Ministry of Women and Child Development, 1st Floor, Jeevan Tara Building, Patel Chowk, Parliament Street, New Delhi-110001) a Report containing detailed account of activities undertaken during BBBP Week with well-captioned photographs, newspaper clippings, press notes, audio-visual clips.